The Golf Stance Part 6: Where should you place your golf ball in your golf stance? Where Should You Place Your Golf Ball? Now that we have determined how we should grip the golf club and how we should stand to swing it, only one question remains in these preparatory maneuvers: Where shall we place the golf ball in your golf stance? For the normal drive the golf ball is teed opposite the instep of the left foot. The position is this far to the left because the ball must be struck at the bottom of the arc of the swing. The bottom of this arc occurs not at a point midway between the feet, but about opposite the left instep or left heel. It is here because the body's center of gravity is moved to the left at the beginning of the downswing by a pronounced shift of weight from the right leg to the left. The left leg is the chief supporter of weight when the golf club hits the ball. Therefore the bottom of the arc is opposite the left foot. We do not intend to make a big deal of ball placement for the other clubs. This has been done in some systems of instruction, with a definite and different spot prescribed for each club in the bag. Such hairsplitting gives the pupil the uneasy feeling that if he doesn't have the ball in exactly the right spot he cannot make the shot. Nonsense! For the other clubs below the driver, the ball is brought back to the right, slightly. 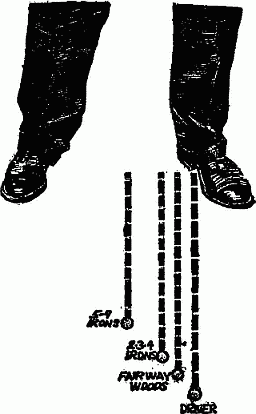 But never farther, for a normal shot, than the center point between the feet. As we use the more lofted clubs they get shorter and our feet are placed closer together. But right down to the most lofted club we do not play the ball back farther than the midpoint for a normal shot. We would, therefore, advise playing all irons from the 9 to the 5, exactly midway between the heels. For the 2, 3, and 4 irons, play the ball about halfway between this midpoint and the left heel. We would play the fairway woods about opposite the left heel and the driver opposite the left instep. Where Should I Place My Golf Ball? The four basic positions: for the driver, for the fairway woods, for the long irons, for the medium and short irons. We realize that some of the touring pros have advised playing the ball about opposite the left heel for all shots and merely moving the right foot closer to the left as the clubs rise in number. This is fine for the pros, who move into the ball so well on all shots. But the average player doesn't move nearly that well. It is much easier for him to get the more lofted irons through the ball with a descending club-head arc if the ball is at the midpoint position. With this we complete the preparatory moves, the actions and positions you take—and avoid taking—as you get ready to swing the club. You have found, to sum up briefly, that you take a tight, two-knuckle, overlapping grip and that this grip, so far as contact with the club is concerned, is a combination palm-and-finger grip with the left hand and an all-finger grip with the right. I have also made it clear that once this grip is welded to the shaft of the club at the address, it does not change or loosen from the time the club leaves the ball on the backswing until the finish of the follow-through. A second point you have learned is how to stand to the ball—how far apart your feet should be, how your weight should be distributed, that you bend only slightly from the waist but that you hunch your shoulders, and, finally, how far you should stand from the ball and where the ball itself should be.